The City of Dhaka - the heart center of Bangladesh. Unlike any other over- populated cities in the world ‘Dhaka’ has a rhythm of its own, which touches every fiver of respective minds and make deep impression for times to come. Dhaka is an ancient city which continues her thrives’ between historical culture and modernization of her society. Our City Tour will give the tourists the true glimpse of a contemporary Dhaka situated on the backbone of factual historical past; in this tour we will find the relics, establishment of Muslim Empire and British Rules of 19th Century and beautiful river Buriganga over this part of the continent. 8.00 AM: Receiving the guest tourist from his/their hotel/rest house or designated addresses and move towards Old Dhaka. 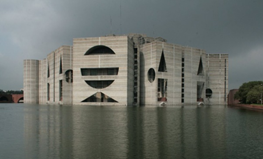 08.45 AM to 09.15 AM: On the way to old Dhaka we will visit outside of National Assembly Building (Parliament Building/Sangsad Bhaban), which is one of the largest legislative building in the world, designed by the famous US architect Louis Kahn. 09.15 AM to 11.00 AM : Visit Lalbagh Fort an incomplete 17th century Mughal fort complex that stands before the Buriganga River in the southwestern part of Dhaka. 11.00 AM to 12.30 PM : Visit Dhakeswari Temple a state owned Hindu temple which is the religious center of the Hindu community in Dhaka. 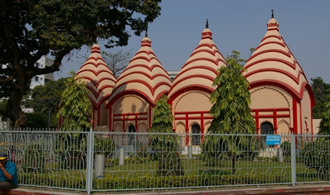 This is also the national Hindu temple in Bangladesh. 12.30 PM to 1.30 PM : Start of Dhaka Sadarghat Area and dropped to an Authentic Local Food Restaurant. 3.00 PM to 4.00 PM : Walk to visit Sadarghat River Station. This is the main river port in Dhaka and one of the largest river station in South Asia. 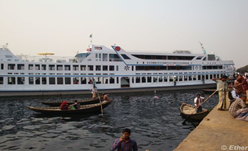 Passenger ferries leave for southern part of Bangladesh from here to all over Barishal Division. 4.00 PM to 6.00 PM : Walk to the boat station and ride a country boat at river Buriganga. This river is a live and vibrant place full of activities. You will see hundreds of country boats crossing people in two side of the river, small vendors selling goods on their boats, passenger and cargo ferries passing by. 6.00 PM to 7.00 PM : Get into our waiting car and drop at the Hotel/residence calling an end of the inner Dhaka tour. In case of visiting Temple and Mosque to see the heritage significances of Dhaka the Tourists have to bind by some dress codes such as Full Pants and Full Shirt or Blouse for ladies and even have to wear a scarf in the hair to visit such places. Shoes should be accessible to loosen up outside mosques and some mandatory places. In case of vast walking light slipper is very much encourageble for the journey. Only on Saturdays, Tuesdays and Wednesday all of the sites will be open. Ahsan Manzil Will be closed at Thursdays and opens after 3.00 pm in Fridays. Lalbagh Fort will be closed at Sundays and opens after 2.00 PM at Mondays. Rest of the sites is open 07 days a week. All the spots mentioned above are easy to access on Friday, Saturday, Tuesday and Wednesday. Thursday and Sunday Ahsan Manzil and Lalbagh Fort remain Close until 2PM. Ahsan Manzil and Lalbagh Fort remain close in Govt. Holidays.